Note: This is the first part of the Derivative Concept Series. The second part is Derivative in Real Life Context and the third part is Derivative and the Maximum Area Problem. If we want to get the slope of a line, we need two points. Suppose the points have coordinates and , we have learned that the slope is described by the formula . In Figure 1, we have line tangent to the function at point where the coordinates of are . The problem that gave birth to calculus is getting the slope of this tangent line. There is, however, a problem. We need two points to compute for the slope but we have only one point. Note that the word tangent in this problem is different from the definition of tangent on a circle because it is clear that line will intersect the graph in more than one point. Figure 1 - Line l tangent to the function f at point P.
Using the concept of limits we can remedy this problem. First, we create point with x coordinate units to the right of the x-coordinate of . We then draw line , a secant line to the function . 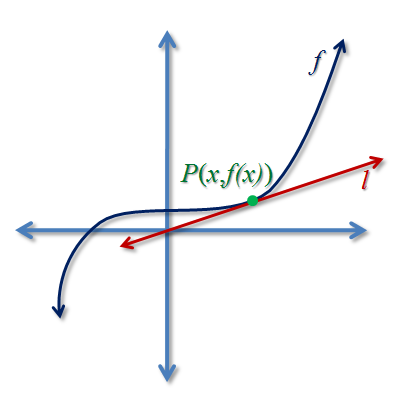 Figure 2 - A secant line is drawn through P.
If we want to approximate the slope of the tangent line, it is reasonable that we move towards with fixed. Click here to explore the diagram above using GeoGebra. 1.) The value of approaches . 2.) The inclination of the secant line approaches the inclination of the tangent line. 3.) The slope of the secant line approaches the slope of the tangent line. 4.) If point coincides with point , then the slope of the secant line and is equal to the slope of the tangent line. The limit of the slope of the secant line as approaches is equal to . The limit of as approaches is equal to . 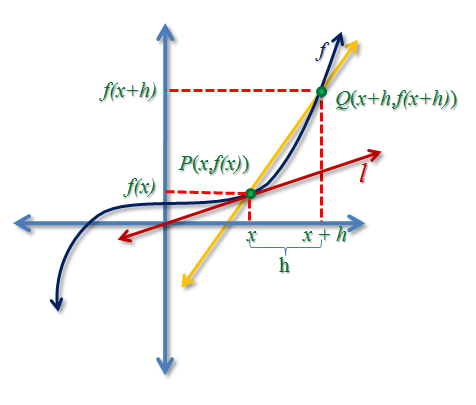 From the above discussion, we can see that the derivative of a function at a particular point is the slope of the line tangent to that function at that particular point. In the next post, we will discuss the meaning of derivative in real life situations.